AvantLink is an online affiliate network that allows businesses to expand their reach through quality partnerships. The platform only accepts vetted merchants and affiliates, so companies can rest assured that they are working only with those serious about the matter. But AvantLink is not just a place to make profitable connections. It is also where businesses have access to advanced API, top-notch tools, and real-time reports that let them set the bar over their competition. With AvantLink, users can also rely on support all the time. The support team offers assistance to anyone—whether a greenhorn or a veteran in affiliate marketing. To ensure the quality of affiliates in the network, AvantLink processes applications with rigor. They have multi-level QA procedures to ensure that applicants are truly serious about affiliate marketing and can assist businesses in expanding their reach. That is why only 30% of applicants pass, so companies can rest assured that they are working only with the best. AvantLink provides businesses with the tools they need to keep track of their partners. These give them insight into the sales they make with a certain affiliate, as well as clicks and impressions. These allow them to ascertain how productive their partnerships are and to make decisions for the good of their company. With AvantLink, businesses can rest assured they do not waste time on reviewing applications. That is because the process is streamlined—they do not have to deal with mass applications or applicants that have been previously rejected. This saves users time and lets them focus more on building quality relationships. 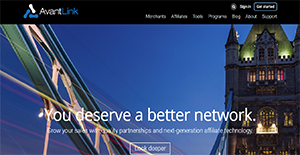 Rather than sticking to the Last Click Wins model, AvantLink is making changes to the networking game by splitting commissions among affiliates. This means that affiliates share in the payout provided for a sale. Businesses are offered attribution data that let them see the impact of affiliates. If you are considering AvantLink it could also be beneficial to examine other subcategories of Best Affiliate Marketing Software collected in our database of SaaS software reviews. It is essential to realize that almost no service in the Affiliate Marketing Software category will be a perfect solution able to meet all the goals of different company types, sizes and industries. It may be a good idea to read a few AvantLink reviews first as some solutions might perform well exclusively in a really narrow group of applications or be prepared with a really specific type of industry in mind. Others can function with an intention of being simple and intuitive and consequently lack complicated elements welcomed by more experienced users. You can also come across software that support a wide group of customers and offer a rich feature base, but this frequently comes at a higher cost of such a software. Ensure you're aware of your requirements so that you get a service that offers specifically the functionalities you search for. How Much Does AvantLink Cost? AvantLink is an affiliate networking platform that helps merchants build solid partnerships. Those interested in the network can request more enterprise pricing information by contacting sales through phone or email. We realize that when you make a decision to buy Affiliate Marketing Software it’s important not only to see how experts evaluate it in their reviews, but also to find out if the real people and companies that buy it are actually satisfied with the product. That’s why we’ve created our behavior-based Customer Satisfaction Algorithm™ that gathers customer reviews, comments and AvantLink reviews across a wide range of social media sites. The data is then presented in an easy to digest form showing how many people had positive and negative experience with AvantLink. With that information at hand you should be equipped to make an informed buying decision that you won’t regret. What are AvantLink pricing details? What integrations are available for AvantLink? AvantLink provides access to its API for users to create their custom tools. If you need more information about AvantLink or you simply have a question let us know what you need and we’ll forward your request directly to the vendor.